A bridal or wedding registry is a list of wedding gifts that an engaged couple has selected in advance. Registry service is typically provided by various stores free of charge to the prospective bride and groom and allows guests to choose things the couple needs or wants. Registering for things like dishes and household items used to be a way for a married couple to furnish their new home, but with many couples cohabitating prior to marriage, modern-day registries include a wide variety of items, with some even requesting donations to help pay for the couple's honeymoon trip. The couple chooses the wedding gifts they want and then their friends and family can access their list either in-store or online. 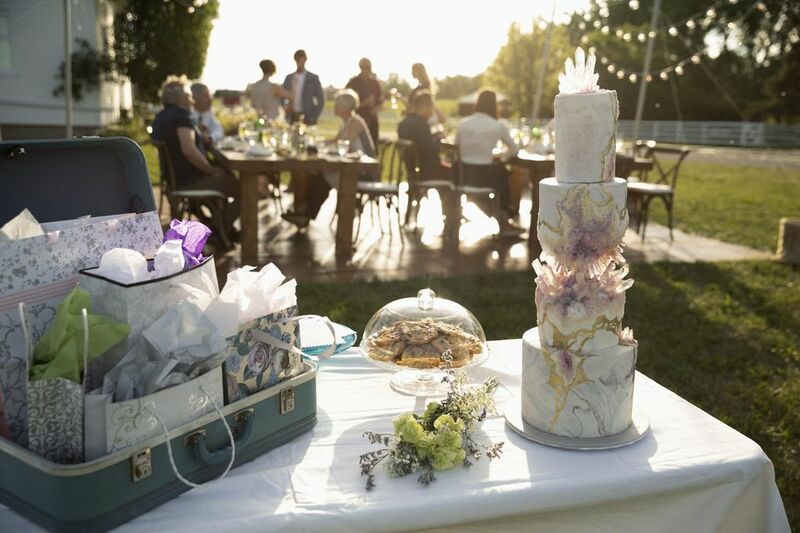 The wedding registry gift list is typically updated whenever an item from the list is purchased, showing what is still available for guests to purchase. Occasionally couples feel guilty or greedy for making a list of their must-have items and may choose not to create a registry. But a registry is really more of a courtesy for wedding guests rather than a list of demands. A wedding registry is a convenient tool for guests to use to give the couple a gift that they know the couple actually wants and will use, instead of having to take a wild guess and risk purchasing something that the couple doesn't like. There's no requirement, of course, that a guest has to pick a gift from the couple's registry. Every couple is different and may choose different items to add to their registry. Popular items on wedding registries include household goods, like kitchen appliances and the like, but if you already live together, chances are you probably already have a lot of these kitchen items. You may opt to put higher-ticket items on your registry, and many stores and websites will let guests contribute toward a portion of an expensive item rather than buying it outright. Traditional registry gifts include China, but unless you see yourself hosting an extravagant dinner party every month there's no need to ask for it. If you're not a cook, don't ask for top-of-the-line cooking equipment. Only ask for the things you truly want and know you will use. Your registry should be an accurate reflection of your lifestyle. Think outside of the box. If you already have everything you need, set up a charitable registry with the I Do Foundation or a honeymoon registry with the Honeyfund. Things like artwork, camping equipment, pieces of furniture and fun things like cooking lessons or art classes are all great things to register for that go against the grain. Department stores are typically the go-to for wedding registries, but online registries are becoming more and more popular. Furniture stores are also great options, especially if you're moving in together. It's a good idea to register with at least two stores. This way your guests have options. Make sure wherever you register is accessible to your guests. Department stores vary by region of the country, and remember, not everyone has a computer to visit your online registry. Don't get carried away with your wedding registry list. A registry that's too small won't include enough variety in terms of price points for your guests, and one that's too large will probably keep you from getting the items you want most. It's also important to keep costs in mind to be courteous to your guests. A registry that includes a good amount of inexpensive items will likely fare much better than one made up of many higher priced gifts. Guests typically spend an average of $85 to $125 on a wedding gift, so it's important to select items in a variety of price points to suit every budget. Make sure you have a range of options for your younger friends who have smaller budgets and your older relatives who can afford to spend a little more. At the end of the day, you know your guests better than anyone so you can structure your registry accordingly.